A teen has been arrested following the assault on Princes Street earlier this month. Police have arrested a teenager following a serious assault in central Edinburgh earlier this month. A man was subject to a serious assault in the early hours of Saturday 1 September on Princes Street. Police were called to the scene at 3.50am and the injured man was taken to hospital. A cordon was also placed around the pavement area between Sports Direct and Mountain Warehouse. Part of the roadway was closed off while a full police investigation got under way. 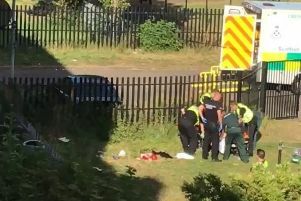 Officers have now confirmed that a 16-year-old male has been arrested in connection with the incident. He is due to appear before Edinburgh Sheriff Court on Monday 1st October.